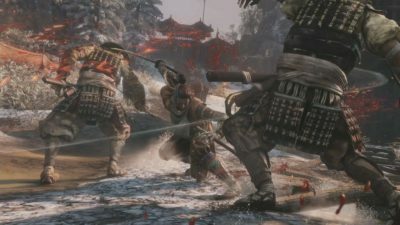 Sekiro: Shadows Die Twice is the new action game by FromSoftware, but what you’ve learned from the Souls games might not help you here. It’s faster paced and as dangerous as ever. So that you can avoid the blows of your enemies, here’s everything you need to know about how to sprint and run faster in Sekiro. The stamina bar that was a huge part of FromSoftware’s previous games has been removed, but that doesn’t mean that you’re not going to be doing everything you can to get out of the way of danger in their new one. To sprint and run faster in Sekiro, all you need to do is hold down circle (or the B button on Xbox One) while you’re moving. As you hold it down, your character will rush in the direction that you’re holding the left analog stick. Do note, though, that you can’t sprint or run faster everywhere in Sekiro. You’re forced to move a little slower around safe areas, which makes sense since you do not need to be rushing around in order to get out of the way of enemies. As you explore the game’s world looking for the path to your objectives or secrets, you’ll certainly want to sprint. However, it is also useful in the combat sections of Sekiro. While you can dodge, roll, and jump to get out of the way of the game’s dangerous enemies, sprinting and running can help too if you need to retreat to heal or consider your options. Just look for a safe space and hightail it out of the danger zone. That’s everything you need to know about how to sprint and run faster in Sekiro. For more tips and tricks on the game, be sure to check out our Sekiro wiki guide or search for Twinfinite.